The future of warfare is here! The various anthologies of Jonathan Strahan's Infinity Project present different ways of looking at the future, whether it is humanity's striving for the stars or the engineering required to build incredible structures almost beyond our current understanding. With Infinity Wars, Jonathan Strahan asks fifteen writers to take a look at the future of warfare. What sort of war would humanity engage in? What would it look like? The answers presented in Infinity Wars are as varied as the writers. Each story show vastly different facets of what future war might look like. This is perhaps most starkly shown in the opening story, "Evening of the Span of Their Days", by Carrie Vaughn. Where so many stories are focused on interstellar war and its direct consequences, Vaughn takes a look at the shipyards which service the ships and how a burgeoning war impacts the lives and the jobs of the dock workers. We want to know more of the conflict raging behind the scenes and the changes it will bring to the dock, but in the end the real story is the understaffed and under-equipped women and men who will do the work keeping the ships in the fight. 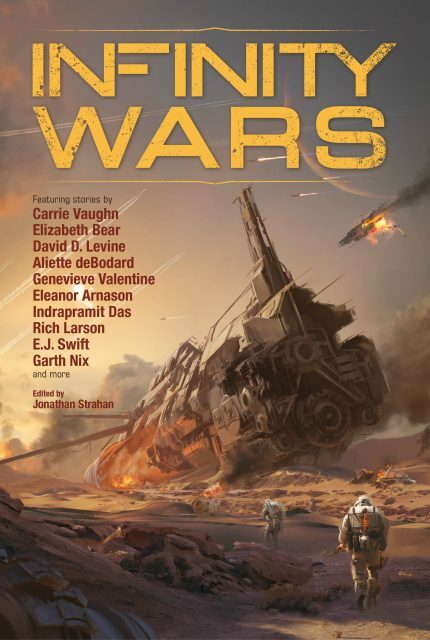 Another story that shows off the range of how war might be fought in the future is one of my favorite stories from the anthology, "Oracle", by Dominica Phettaplace. It begins with "the two biggest applications for predictive software are killing people and selling things". Rita's AI made her incredibly successful at selling thing, but she couldn't say no when the Department of Defense came calling, asking her to use her software to choose countries to invade that would result in wars popular enough with the American public to boost the approval numbers of the narcissistic sitting President. The story comes across as a little more narrated than lived in, but with the cynicism of when presidents order airstrikes (to distract from personal crisis) and how successful war bolsters popularity, it's a prescient story. There are, of course, a number of boots on the ground stories in Infinity Wars. "The Moon Is Not a Battlefield" is a less successful story of the grunt level soldier fighting proxy wars on the moon, whereas David D. Levine's "Command and Control" does a better job at telling a straight up action story of a war between India and China with some interesting future technology. One story I found interesting, if wholly unsatisfying, is An Owomoyela's "The Last Broadcasts". This is a story of a a classified project to put out false news broadcasts from Caribou, a distant human colony under attack from an alien invasion most of the rest of humanity spread across the galaxy has no idea about. The colony is about to go dark because it will be completely overrun, but Daja's (the protagonist) job is to come up with a more palatable reason for Caribou's lack of future communication so as to prevent a galactic panic. The most interesting aspects of "The Last Broadcasts" are everything surrounding the story and the way Daja interacts with the world and struggles to keep herself focused and on task. The least interesting aspect of the story is the actual story - how Daja takes the job and immediately puts herself in conflict with her job and her superiors and her sense of morality towards Caribou. I also appreciated "Conversations with an Armory", by Garth Nix. The concept here that I loved is that of all major military warships AND armories having artificial intelligence. The story opens with beleaguered troops trying to convince an armory to let them in so they can throw together one last ditch fight back at the alien enemy and the AI not recognizing theor authority. It's darkly comic, at moments almost worthy of the best of Joseph Heller. Though there were some disappointments in Infinity Wars (the aforementioned "The Last Broadcasts"and "The Moon is Not a Battlefield", as well as "Faceless Soldiers, Patchwork Ship"), Strahan delivers an overall solid and eminently readable anthology with some truly standout stories. Besides "Oracle", readers should consider picking up Infinity Wars just to read "Dear Sarah" and "ZeroS". "Dear Sarah" is the story of Mary Jo, a young woman from a family suffering from increasing poverty caused by her father's job loss due to alien technology replacing human labor. It's a deeply relevant story to America today and notes the reality of America's poorest making up a significant portion of enlistments because the military is viewed as a way up and a way out. Except now, the military is fighting American rebels who are against the nation's alliance with the aliens (the rich benefit, the poor continue to lose out) and each battle is a battle against our nation's poorest. Nancy Kress has written a knockout and as happens so often with Kress, I'd love to read more of these stories. "ZeroS", from Peter Watts, is the class of this anthology. The super short explanation about basically making zombie super soldiers (of sorts) with a human mind running backup in the new body. Watts has intensely strong storytelling and action sequences. I understand that's it's a bit of a prequel story to Watts' novel Echopraxia. Hell, don't worry about any of that, just go read the story. Then go read the anthology. Bonuses: +1 because the highs of Infinity Wars are really damn high. Penalties: -1 for the middling and forgettable stories, one of which I honestly forgot that I read one day after reading it. Nerd Coefficient: 7/10 "a mostly enjoyable experience". See more about our scoring system here.